Stefan Nystrand demonstrates a sprinting technique that contradicts many of the espoused properties of successful sprint swimming where direct propulsive forces are produced. However, he does display characteristics that offset the criticized elements of his stroke. The swimmer recovers with almost vertical straight-arms. The vertical forces created by the pronounced movement arcs cause alterations in underwater actions. The following video clip illustrates the pronounced straight arm recoveries. It occurs 17+ seconds into the race. Because of his high rate of ballistic stroking, Stefan Nystrand is unusual in that he performs a 4-beat kick. Kicks of each leg counterbalance the entry and exit of each opposite arm. The high rate does not allow sufficient time to perform six leg movements. That restriction is emphasized by the need to execute very large leg movements to counterbalance the very large vertical forces created by the arm actions, particularly on entry. Frame #1: The right arm has entered and is driven directly down. The verticality is evidenced by what follows the fingers, a faint pocket of drag turbulence that has a vertical forward boundary. The right arm begins to bend at the elbow. The left leg kicks exceptionally deep [on this web site there is no swimmer with a deeper kick]. This single example should put to rest the assertion that kicking in crawl stroke is propulsive. Nystrand’s leg is followed by a huge drag pocket, which would slow the swimmer considerably. The right leg appears to break the water surface in preparation for its kick. The swimmer is streamlined. Frame #2: The right arm has some elbow bend and is powered by abduction of the upper arm. The arm's force components are largely vertical with a lesser amount being horizontal. The swimmer remains streamlined. Frame #3: The complete right arm has been pressed backward [the drag pocket along the entire arm attests to the fact that even the upper arm contributes to propulsion as an effective propelling surface in the middle of arm propulsion]. At this point, the fingers of the right hand have reached the greatest depth. The swimmer appears to be moving off streamline, apparently in the early stages of breathing to the right. Frame #4: The right arm has risen sharply along a largely vertical path. The position of the fingers in this frame relative to the residual turbulent pocket created in the previous frame illustrates the large vertical force that is produced. To counteract the force developed by the exiting right arm, the left leg kicks again, the second of its two-kicks-per-stroke function. The left arm enters and the right leg begins to kick across a "huge" arc. The amount of knee bend at this commencement position is exceptional for a top swimmer. The swimmer has lost streamline as the head is raised and turned to breathe. The imposition of the left arm underwater action on the right arm underwater action constitutes what has been called a "supraposition". It reduces the amount of inertial lag between arm propulsions. Frame #5: The right arm exits and the counterbalancing left leg kick is completed. The left arm enters and drives/knifes directly downward. The direction of the movement is told by the stream of drag turbulence that rolls up the front side of the arm. This is a different movement to that displayed with the right arm. The right leg kicks. The loss of desirable streamline continues. Frame #6: The depth of the right leg kick is somewhat misleading. 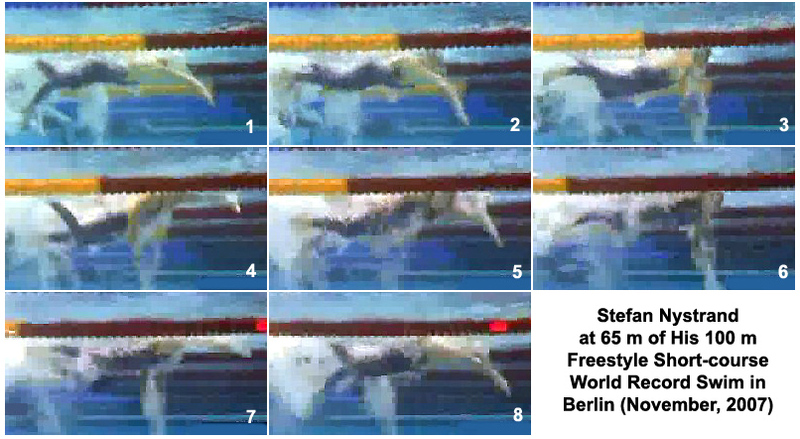 Due to the breathing action, the swimmer has turned partly to the right side, probably causing the kick to go partly to the side instead of completely down (as was illustrated in Frame #1). The left arm achieves a position similar to that attained by the right arm in Frame #3. For a brief moment, the arm is completely propulsive but deep. Frame #7: The position illustrated in Frame #4 is mirrored in this frame. Similar movement characteristics exist and suprapositioning is attained. Some streamline has been recovered. The size of the left arm force production is witnessed by the amount of residual drag turbulence that exists in the water. Frame #8: A position similar to that illustrated in Frame #1 is attained but with less streamline. The swimmer performs with an exceptionally high stroke rate. The benefit derived from a high rate is that there is less time for negative acceleration of the swimmer between arm strokes. As well, a high rate also allows a swimmer to produce more maximal force applications through the arms than would occur with a lower rate. This stroke provides a higher frequency of maximal propulsive forces and less slowing between arm applications. The swimmer produces a superimposed stroking sequence. Before one arm has completed its stroke (i.e., it has completed its force production), the other arm is already in its underwater sequence developing propulsive forces, although those forces are only horizontal component forces as the arm is driven down after entry. This further reduces the occurrence of inertial lags in propulsion. It comes close to satisfying Newton's First Law, which implies that movement is most efficient when it can sustain continual force applications. This feature will allow the swimmer to maintain high velocities longer because the energy costs of negatively and positively accelerating between arm actions are reduced markedly. When the swimmer does produce direct horizontal propulsion, the forces are very large (see Frames #3 and #6). A high frequency of relatively short-duration but large force productions in a continuous manner (no inertial lags) could well be the next advance in sprint swimming technique. Stefan Nystrand may well have illustrated some features of sprint swimming that are particularly effective for him and possibly for other swimmers. He has taken arm rating to a new high, has reduced the number of kicks (which this writer has always argued are not propulsive in crawl stroke), and shown that the total arm is capable of producing a large propulsive force in the "middle" of the underwater pull. The combination of those factors has developed an improved consistency in force application which has resulted in the maintenance of higher velocity. Stefan Nystrand's sprint speed is understandable.